Beast Kingdom introduces the D-Select series, which allows you to put together the Disney diorama of your dreams, and recreates classic movie characters and scenes with expert professional techniques.From the character's expression to minute location details, the D-Select series provides collectors with a detailed, exquisite addition to their collection. The Disney Tsum Tsum D-Select Series DS-002 6-Inch Statue - Previews Exclusive recreates classic moments from the animation, complete with adorable classic characters! Perfectly combines a delicious chocolate house and classic characters into a 6-inch space. 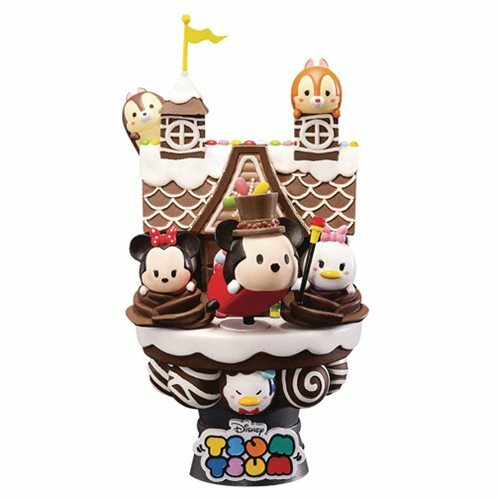 From the chocolate house to the adorable roly-poly Tsum Tsums, everything is exquisitely detailed and painted, adding a feeling of realism to the chocolate house. Additionally, the characters lively expressions add a feeling of life to the characters. The special logo tag and platform adds extra adorable value for collectors. Ages 15 and up.